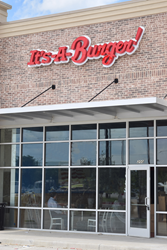 It’s-A-Burger, a fast-casual restaurant, has opened a second location in Little Elm. It’s-A-Burger, a fast-casual restaurant, has opened a second location in Little Elm. The Denton based restaurant’s new location is at FM423 and Panther Creek Parkway. A ribbon cutting ceremony will be held on November 7th at 11:00am to highlight the Grand Opening. A weeklong celebration from November 6 through 12 will take place at the restaurant and will include 10% off all orders and a 10% donation from all sales to the Frisco Lone Star High School Fine Arts Program. The first It’s-A-Burger restaurant opened in summer 2016 on U.S. 380 in Paloma Creek. During the Little Elm Grand Opening, the Paloma Creek It’s-A-Burger will celebrate a Re-Grand Opening with the same 10% discount all week long and 10% of the proceeds benefiting Bell Elementary School. A third It’s-A-Burger restaurant to be located in Denton is expected to open in early 2018. For more information about It’s-A-Burger go to http://www.itsaburger.com.